The world is shrinking. Not in size but, rather, in the length of time it takes to get anywhere. It has been said that everything is in walking distance, it just depends on how quickly you want to get where you're going. A little over two hundred years ago we traveled at the speed of a horse. That was quickly replaced by the speed of a train in the early 1800s, and soon after that the speed of a horseless carriage. In 1903, Wilbur and Orville Wright tested what many believe was the first successful airplane. Why do we give you this history lesson? It is important to understand that getting from underdeveloped countries to the United States used to take a great deal of effort. Now, it can be done in under a day. Understanding the threat of mosquito-borne illnesses begins here. It is estimated that over 1 million people die every year due to mosquito-borne illnesses. If you live in the United States, that may surprise you. That is because we don't have nearly as many mosquito-related deaths here. 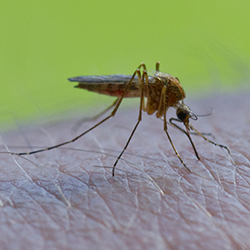 Dangerous mosquito-borne illnesses like malaria, West Nile virus, Dengue fever, Zika, Chikungunya, and yellow fever do not have the same impact in the states. But, we are not immune. Americans can and do die from viruses spread by mosquitoes. With recent news stories about the Zika virus, you have probably heard the term, "travel-related" referenced when discussing the Zika virus. This is because Zika does not exist locally in the United States, nor do many other mosquito-borne illnesses. In order for these viruses to spread here, they must be brought in by travelers. So, travel-related cases must be watched closely. If you hear the term "localized," in reference to Zika virus, it usually means there is an outbreak that is being passed through local mosquitoes. It does not mean the virus has taken root in the United States. Health organizations track circulation to determine whether or not a virus has found a local reservoir. Reservoirs are mammals that help mosquitoes to contract the virus every year. Mosquito don't live long. The life span of a mosquito is 60 days at best. They require mammals, which live through the winter, to contract a disease locally. The increase in world travel has increased the number of localized mosquito-illnesses that have found a reservoir in the United States, as well as the number of travel-related outbreaks that have occurred. West Nile is a virus spread by Culex mosquitoes and has a reservoir in local bird populations. This virus is spread to humans through the saliva of mosquitoes during feeding. This virus multiplies in the bloodstream and is translated to the brain, resulting in inflammation and disruption to the central nervous system. This illness is referred to as encephalitis. Extreme cases result in coma or death. There are approximately 2,000 cases of Malaria reported each year in the United States. The vast majority of these cases are travel-related. This is a dangerous virus that claims over 600,000 lives worldwide every year. The mosquito most responsible for the spread of malaria is of the species Anopheles. Zika virus is a virus that is directly connected to microcephaly in unborn children and Guillain-barre syndrome in adults. It is not yet known to have a reservoir in the United States, but there is concern that it won't be long. Dengue rarely occurs in the United States and is connected to travel-related cases that spread to local mosquito populations, but the United States does have conditions that can sustain dengue transmission. This is a tropical disease that has, to this date, only affected Texas, Hawaii, and Florida. The front line defense against the spread of mosquito-borne viruses is mosquito reduction services. Mosquitoes rarely travel more than 300-500 yards in their entire life. Mosquito treatments break the vector for mosquito-borne illnesses and work to reduce the miserable bites these insects cause us when we relax in our backyards. If you would like assistance with mosquito abatement, and you are in our service area, American Pest Solutions has industry-trusted mosquito services that can help you protect your family and make it a whole lot nicer to be in your backyard. For more information, contact us today. August 10, 2016 - Where Do Flies Come From?